WASHINGTON (CNN) -- Congressional leaders from both parties were optimistic Monday after meeting with President-elect Barack Obama to discuss his package of tax cuts and spending proposals aimed at reviving the beleaguered economy. 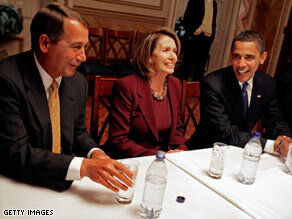 President-elect Barack Obama talks with Rep. John Boehner and House Speaker Nancy Pelosi on Monday. Senate Minority Leader Mitch McConnell, R-Kentucky, said after the meeting that the "atmosphere for bipartisan cooperation was sincere on all sides." "We welcome the opportunity to be included in the discussion," said McConnell, who was joined at the meeting by House Speaker Nancy Pelosi, D-California, Senate Majority Leader Harry Reid, D-Nevada, and House Minority Leader John Boehner, R-Ohio. "I commend the president-elect for his determination to act in a bipartisan way," Pelosi said. Obama on Monday began his push for the economic stimulus package. He is also planning to deliver a major speech on the economy Thursday, a senior Democratic official told CNN. The president-elect will propose roughly $300 billion in tax cuts for individuals and businesses. He has not publicly put a price tag on his overall stimulus plan, though his advisers have said they expect it to fall between $675 billion and $775 billion, 40 percent of which would be in tax cuts. According to an Obama spokesman, several tax breaks are under serious consideration. • Middle-class tax cut: Obama would offer a tax cut equal to $500 a year for individuals and $1,000 for couples. The credit would work essentially as a payroll tax credit, meaning the money could be delivered fairly quickly. Companies could simply reduce the tax they withhold from employees' paychecks. The tax credit is likely to be offered only to those below a certain income level, but the Obama team hasn't specified where the cut-off point would be. The credit also would be refundable, meaning that even tax filers without any tax liability -- typically very low-income workers -- would receive one. • Business break for losses: Obama is considering a tax break for businesses that book losses in 2008 and 2009. The stimulus plan may extend what's called the net-operating loss carryback to five years, up from two years currently. The provision lets companies apply their losses to past and future tax bills so that they can get money back on taxes they've already paid or would otherwise have to pay. • Job creation: Obama would establish a new credit for businesses that either create jobs in the United States or avoid layoffs. • Small-business write-off: Obama would increase the amount of expenses small businesses can write off to $250,000 in 2009 and 2010, up from $125,000 currently. While political observers believe the now-added emphasis on business tax cuts as a major part of a stimulus package is one way the Obama team hopes to attract Republican support, that's not how the Obama camp explains it. "We're working with Congress to develop a tax-cut package based on a simple principle -- what will have the biggest and most immediate impact on creating private-sector jobs and strengthening the middle class. We're guided by what works, not by any ideology or special interests," an Obama representative told CNNMoney.com in an e-mail. -- Double renewable energy production and make public buildings more energy efficient. -- Rebuild crumbling roads, bridges and schools. -- Computerize the health-care system. -- Modernize classrooms, labs and libraries. Some Democrats and Republicans have already raised red flags about the scope of Obama's proposals and the prospect of a rushed attempt to pass the legislation, which would be the most expensive spending bill in U.S. history. Boehner said he was concerned about the price tag. "I'm a little concerned, myself, about the overall size of the package. This is not a package that's ever going to be paid for by the current generation. It's going to be paid for by our kids and grandkids," Boehner said. Obama said Monday that he set up the meeting to find away to create a bipartisan dialogue. "We may have disagreements, but I think it's going to be possible for us to work out those disagreements in the atmosphere of civility and comity," Obama said. "The American people, I think, are counting on us to act swiftly, boldly, but responsibly, in dealing with these issues. CNN's Kate Bolduan and CNNMoney's Jeanne Sahadi contributed to this report.